Assigning a static IP address on a computer allows it to obtain the same IP address every time it boots up. The static IP address that you will create should have the same first three (3) sets of numbers on your router’s local IP address. This enables the router to determine that the computer is part of its network. For example, if the router’s local IP address is 192.168.1.1, the static IP address that you may assign will be 192.168.1.X, where X can be any number between 2 and 253. Follow the steps below to know how to set up a static IP address on different operating systems. NOTE: This article assumes that you know your router’s local IP address, Subnet mask, Default gateway, and DNS server values. You need them to set up the static IP settings on your computer. Otherwise, access your router’s web-based setup page to check them. For instructions, click here. If you’re using a Mac® computer, click here. 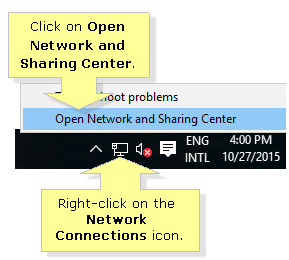 Right-click on the Network Connections icon located on the system tray, then click on Open Network and Sharing Center. 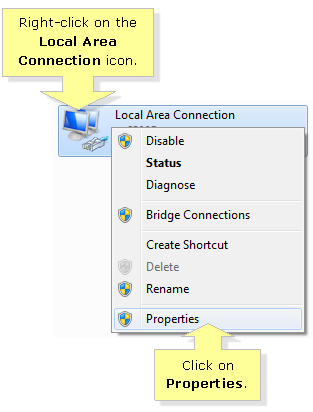 Right-click on the Local Are Connection icon and click on Properties. Select Internet Protocol Version 4 (TCP/IPv4) and then, click on Properties. Select Use the following IP address option and enter the necessary information in the IP address, Subnet mask and Default gateway fields. NOTE: The Default gateway is your router's local IP address. Select Use the following DNS server addresses option and then, enter the Preferred DNS server and Alternate DNS server addresses, which are obtained from your Internet Service Provider (ISP). Press the Windows key on your keyboard to show the Start screen then, click Desktop. QUICK TIP: Alternatively, you can press the Windows key + D on your keyboard to show the Desktop. 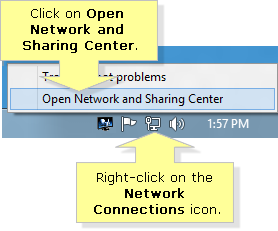 Right-click on the Network Connections icon located at the system tray, then click Open Network and Sharing Center. 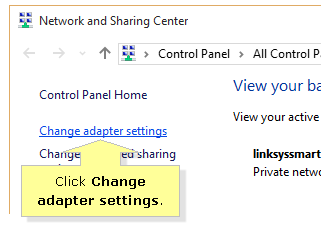 Right-click on the Ethernet adapter icon and click on Properties. Select Use the following IP address and enter the necessary information in the IP address, Subnet mask and Default gateway fields. Select Use the following DNS server addresses then enter the Preferred DNS server and Alternate DNS server addresses which are obtained from your Internet Service Provider (ISP). Click the Start button and then, click Control Panel. In the Control Panel window, click on View network status and tasks. 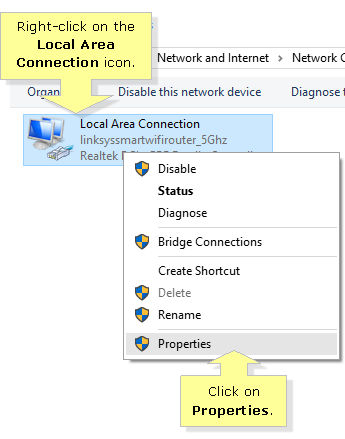 Click on Local Area Connection. 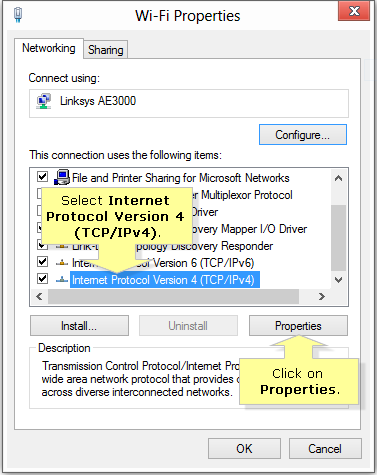 Select Internet Protocol Version 4 (TCP/IPv4), then click the Properties button. Select the Use the following IP address: radio button and enter the necessary values in the IP address, Subnet mask and Default gateway fields. NOTE: In this example, the IP address of the router used in the Default gateway field is “192.168.1.1”, while the Subnet mask used is “255.255.255.0” and the static IP address for the computer is “192.168.1.50”. Click the Use the following DNS server addresses: radio button and enter the Preferred and Alternate DNS server IP addresses, which are obtained from your Internet Service Provider (ISP). 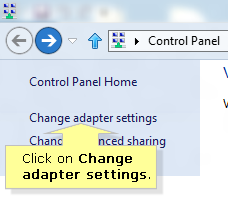 Click Start, then click Control Panel. 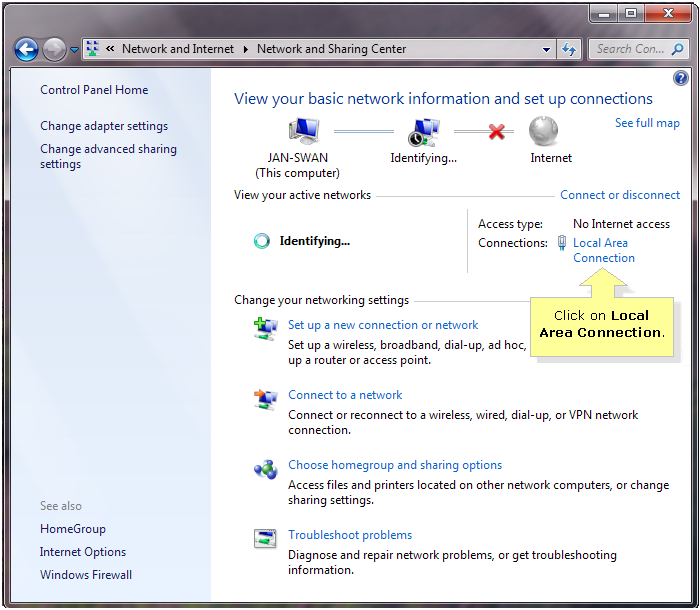 On the Control Panel window, double-click Network Connections, then right-click the Local Area Connection icon and select Properties. 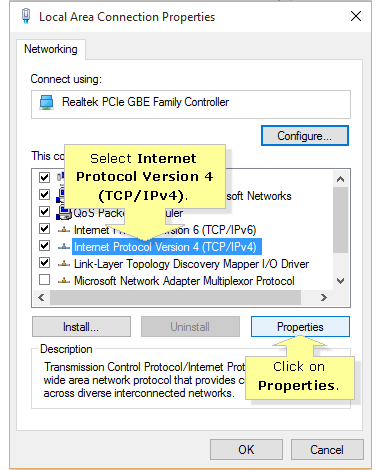 On the Local Area Connection Properties window, select Internet Protocol (TCP/IP) and click Properties. Click the Use the following IP address: radio button and enter the IP address, Subnet mask and Default gateway in their respective fields. NOTE: In this example, the IP address of the router used in the Default gateway field is “192.168.1.1” while the Subnet mask used is “255.255.255.0” and the static IP address for the computer is “192.168.1.50”. 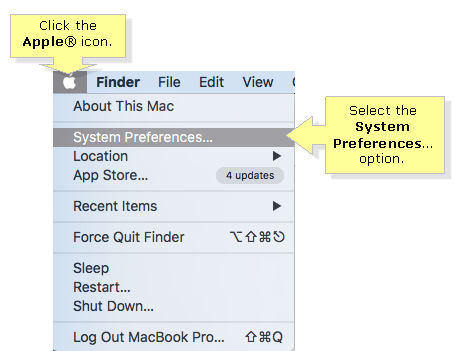 Click the Apple® icon located at the top left corner of the screen, then select the System Preferences... option. 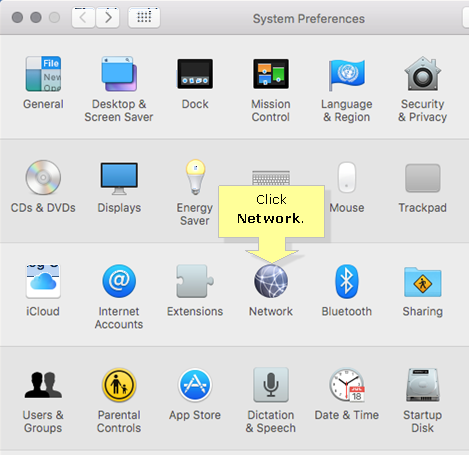 On the System Preferences window, click Network. 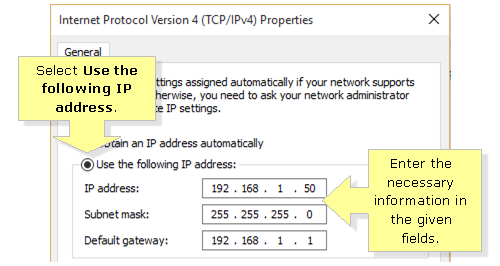 On the Network window, select Automatic for the Location and Manually on the Configure IPv4 drop-down. 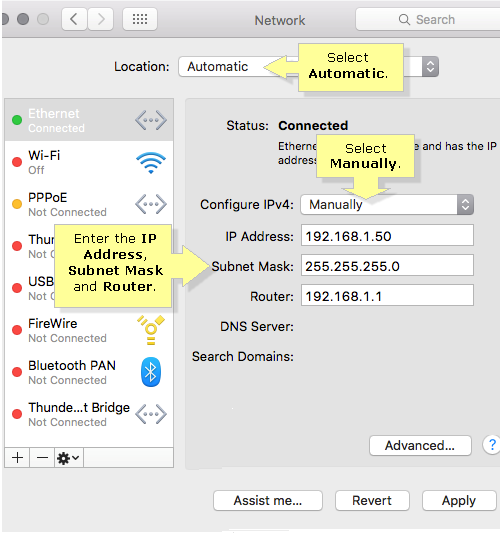 Enter the static IP address in the IP Address field, the subnet mask in the Subnet Mask field, and the router's local IP address in the Router field. Click Apply to save the changes.